The law firm of Gary Osborne & Associates is dedicated to obtaining justice for victims of medical malpractice and nursing home negligence. Preventable medical errors by doctors, hospitals and nursing homes are a leading cause of death in the United States. Victims of such medical errors are entitled to be compensated for injuries and death that result. At Gary Osborne & Associates we have been investigating and litigating potential medical malpractice cases for over 20 years. These cases are demanding and require extensive knowledge in the medical field that our law firm can provide. We seek out the best available experts, throughout the country, to review your potential claim to determine whether it is valid and can successfully be litigated. We take great care in evaluating these cases, as they are expensive and time consuming to prosecute. We only proceed after receiving opinions from highly qualified experts that a hospital, nurse or doctor was negligent and serious injury has resulted. At Gary Osborne & Associates we believe that the vast majority of medical care is provided by competent and caring doctors and nurses. Yet doctors, must be borne by the negligent health care provider and not the injured hospitals and nursing homes must be held accountable for their negligence that causes injury or death to innocent patients. The cost of these injuries victim and family, or be passed on to society, thereby increasing the cost of medical care to all of us. 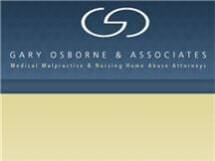 Gary Osborne & Associates have a proven record of success in handling medical malpractice and nursing home cases in Northwest Ohio and other distant Ohio counties. With a focus on medical malpractice and nursing home claims, our lawyers have the skill and experience to successfully litigate the complicated issues involved in these medical cases. At Gary Osborne & Associates we have the financial and medical resources to provide you with the quality legal representative that your case requires and deserves.